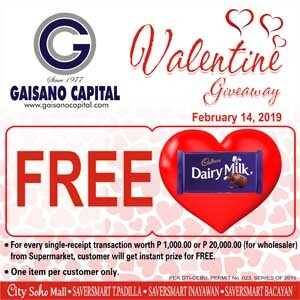 For every single-receipt transaction worth P 1,000.00 or P 20,000.00 ( for wholesaler ) from Supermarket, get instant prize for FREE. Participating Branches: City Soho Mall, Saversmart T.Padilla, Saversmart Inayawan & Saversmart Bacayan. See posters for complete details.